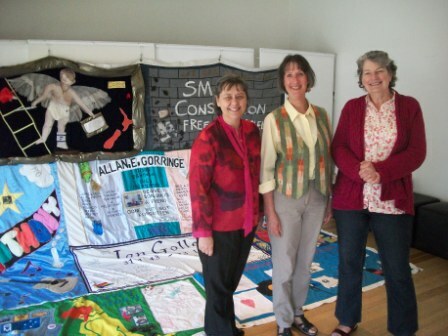 Today we sang in Altona, a suburb of Mebourne, as part of the AIDS Memorial Quilt Workshop. If you read this blog regularly, you know that I’ve just finished a year of a challenge called “Scatterdays”, hosted by Cinzia. 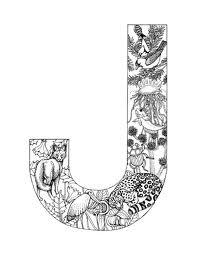 By the end, only a few of us continued with posting pictures to fulfill the challenge of finding things in four categories that all started with the same letter. We made it through the whole alphabet, and felt very happy to have survived it! It was fun, and I’m missing it, now that it’s over. But it’s great to be able to meet a couple of them in person! Vireya and Wendy both came to the gig today, and we had some time before the show to get to know each other a bit. It was great! We will be leaving Melbourne tomorrow, having successfully survived the VERY hot weather (and so thankful WE didn’t have to play tennis in that heat), and spending time with some friends and relaxing. Onward towards Sydney! I am sorry to say this is the last Scatterdays – we’ve run out of letters! I’ve thoroughly enjoyed doing this little challenge – it’s led me into some interesting topics, to say the least! I hope you’ve enjoyed reading about them as well. We have just arrived, after 5 long flights in three days which included brief stops in Shanghai (where I couldn’t get on either Facebook or this blog – they are apparently blocked in the country) and Sydney, in Darwin. We are back in the tropics, in the Wet Season. I love it here, and woke to the sound of Rainbow Lorikeets – one of the prettiest birds in the world, with an appalling screech that proves my theory that the more beautiful the bird, the less sweet it sounds. We are staying with our good friends Alison and Kevin, and we have a lovely view of downtown Darwin from our bedroom window. Alison is a wonderful quilter with a great sense of colour. My submission for a Y word in the bedroom? Her YUMMY quilt we are sleeping under! 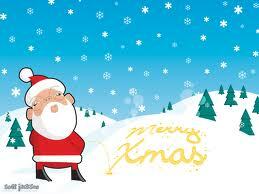 YULE! 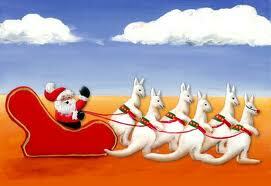 It’s an unusual Christmas for us – we are in Australia (just arrived in Darwin last night!) We are looking forward to having a hot Christmas – barbie on the beach with some bubbly, etc. Something I am pleased to have finished. Of course, this is my latest quilt. A part of my current “Refractions” series, in preparation for my gallery show which opens February 20th at the Cedar Hill Arts Centre in Victoria BC. I am to have 10 pieces for this show, and I’ve been working on it for the last year and a bit. I’ve just had 3 weeks at home in between tours, and put my nose to the grindstone to make number 9 in the series. ONE MORE TO GO!!! 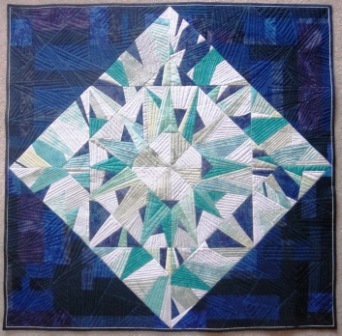 I’ll be home for 2 weeks in early February, just before the show opens, and I’ll make the final quilt. That meant I HAD to get this one done before we left for Australia. 50 hours and a bit later, here it is: Ice Diamond. I want to thank Cinzia for the invitation to join this Scatterdays challenge. It’s been wonderful to participate, and to read what the other Scatterdayers have been posting as well. There are plans for us to get together with some of them on our Australian travels, during the next month in Melbourne at least. To see what the others have done this time, visit Cinzia’s blog. I’ll be posting occasionally about our Aussie travels. You are welcome to join me in my journey, if only from your armchair! This week’s categories are: SUNDAY, WET, ROUND, and COLOURFUL. 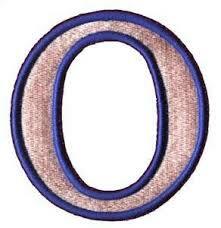 In my formative years as a musician I lived in Ottawa Canada. Not only the nation’s capital city, Ottawa boasts two universities (I went to Carleton), a very historic canal that is drained for the winter so that everyone can skate on it, and a great folk music scene. When I was there all the musicians were playing with everyone else, cross-pollinating their musical styles. We played at lots of restaurants, benefits, concerts, and COFFEEHOUSES. The long-standing one was called the Sunday Night Hoots (short for Hootenanny). It started at Le Hibou Coffeehouse and when that establishment closed its doors, it was moved to the Jack Purcell Community Centre. For easily ten years I could be found almost every Sunday evening at the Hoots. It’s where we listened to 15-minute sets by all kinds of musicians, many of whom were finding their stage legs. It was a great place to try out new songs, and Lynn Miles (who has gone on to much greater things in her music) used to write a song every Sunday and come to sing it at the Hoots that night. Very heady times for all of us. 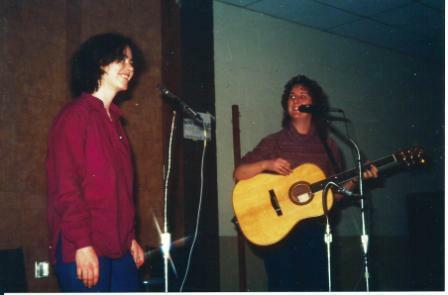 A much younger me with my friend Louise Kwan (now Horton) at the Sunday Night Hoots coffeehouse. I’ve no idea what we might have been singing together that night. This is probably from 1979. I’ve already mentioned the Rideau Canal in Ottawa which I’ve skated on many many times, although not for years. But I have a better CANAL to tell you about! The view from below – the aqueduct is 126 feet above the valley below! What it looks like on the bridge. 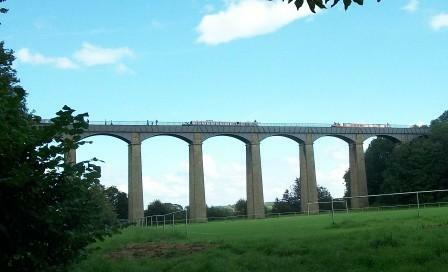 We walked across the bridge on the tow path, which you see above. On the other side of the canal, there’s a sheer drop, without even a fence. 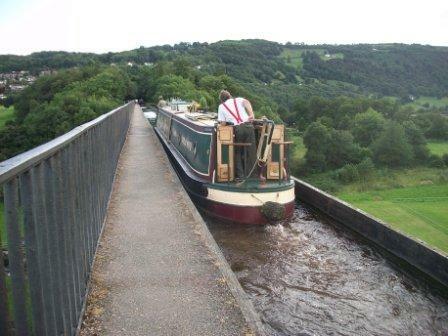 See the skipper of this narrow boat leaning over to the left as far as he can? He was NOT AT ALL COMFORTABLE with being this high above the ground all of a sudden! I’m going to combine these two topics in one picture. 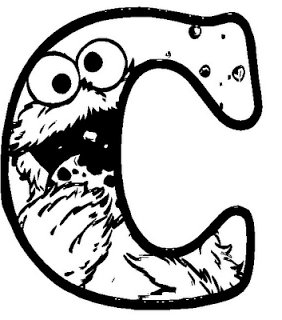 The fact is, there are SO MANY round things that start with C! Cabbages, cake, circles, clocks, cranberries, cannons, cones, cantaloupes, cheese, cents cups, curves, cylinders, cherries, coconuts, coins, cymbals, etc, etc, etc. It was hard to pick just one. 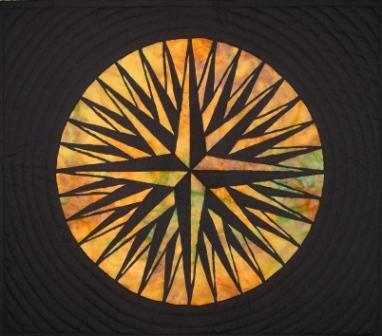 Until I found my colourful quilt, and realized it would do for both: a COLOURFUL COMPASS that also happens to be ROUND! This is one of my class samples for the Mock Mola applique class I teach. It is not pieced, but done with raw-edged reverse applique. Quick and easy, and oh-so appropriate for this challenge! I’m sad to say there’s only one more Scatterdays letter to go. I’ve really enjoyed participating in this challenge, and I hope you have too. In two weeks I’ll be posting my Ys: BEDROOM, WINTER, HOT and YAHOO! (pleased to have finished it!) pictures. I’ll be doing this from Australia! Maybe I’ll get to meet some of the other Scatterdayers while I’m there. See you in a fortnight. To see what some of the others have posted, visit Cinzia’s page and see the links on the right. In going through the alphabet this morning, I went through “Gel”, “Gut”, “Glove”, “Glands” and “Glutes” – you are NOT going to see pictures of these things – too Gross!!! 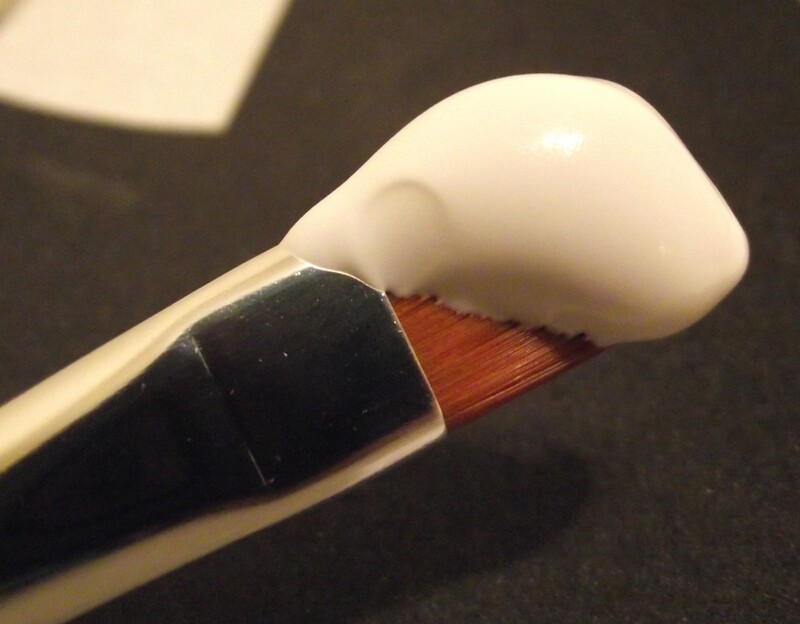 Instead, I remembered what artists use to give body to their canvases before they paint on them: Gesso! 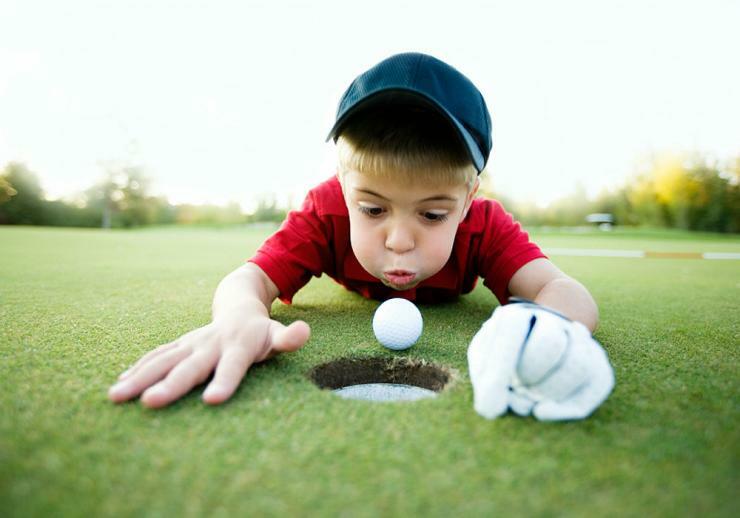 My mother was a keen (if not terribly Good) Golfer. She worked very hard at it, and was so excited by the game that she encouraged me to come and play with her every time I came to visit. She lived in Victoria BC; I didn’t at the time. Now, I live 2 doors away from the golf course where she used to play. I don’t play at all, but I remember her every time I walk around it. Image courtesy of Tourism Tofino (which is on Vancouver Island). What to serve for lunch? Some German sausage with Goose liver pate, topped with Giblet Gravy? And for dessert perhaps some Green Gelatin. Sounds quite Grim to me. 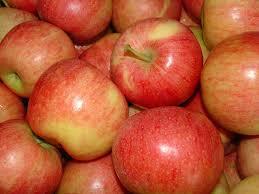 But I do know one of my favourite things to eat at lunch: Gala apples! I have just returned home today from our Texas tour – it was all Great, but still, I’m very happy to be home! 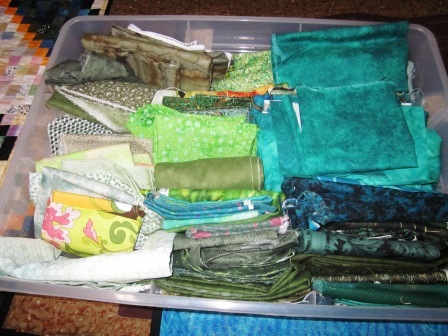 I’ve gone downstairs into my sewing room and pulled out my green drawer of fabrics. It’s looking a bit thin just now, but I have bought a few new hand-dyes that I can add to it when I unpack. Well I must say this one almost daunted me! But I woke up this morning with all the categories sorted out, so here goes… TWO days early!!! 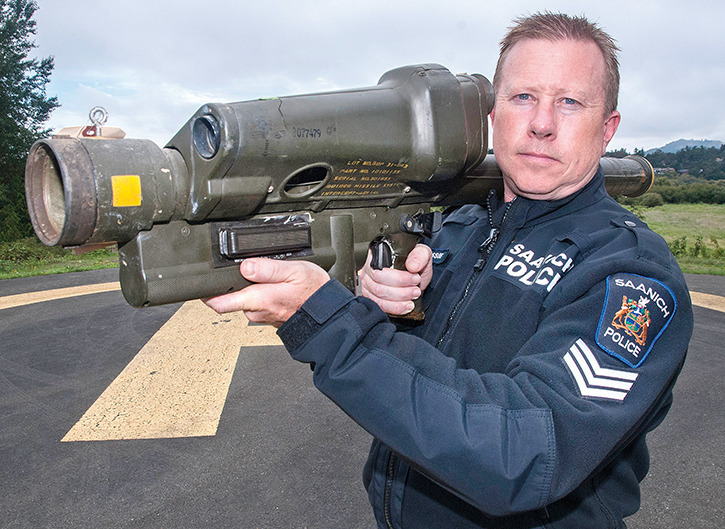 I live in Victoria BC, a couple of doors away from the Cedar Hill Municipal Golf Course. Neither of us is a golfer, but there is a lovely perimeter walk on a chip trail that we use quite often, especially during blackberry season (Yum!). At one end is a wild area called KING’S POND, where dogs have to be on-leash, and migrating ducks make their temporary homes in the winter. 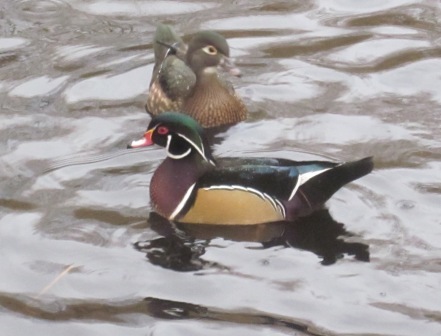 I get some great birdwatching done then: lots of mallards, of course, teals, widgeons, coots, shovelers, ring neck ducks and my favourite: wood ducks! 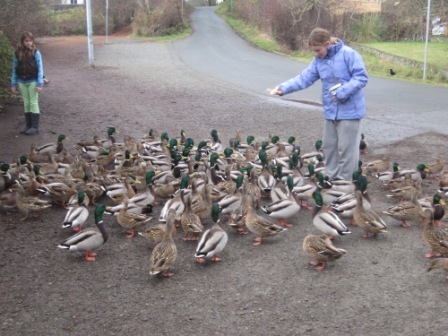 We have been known to feed the ducks with a grain/corn mixture. They like it a lot! Our granddaughter with lots of friends. Kabobs, kaiser rolls, ketchup, kippers, Krispy Kreme donuts, and Kiwifruit. In my garden, I’ve grown Kohlrabi and KALE, although the recent raccoon visitor seems to really like the kale. It’s okay – I’m not home to eat it just now anyway. 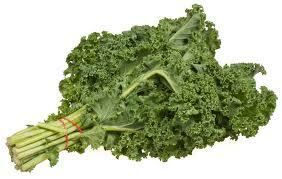 I LOVE kale! My favourite way to prepare it is to take the stalk out and break it into bite-sized bits. I saute olive oil and garlic, deglaze with sherry, then throw the washed kale in, covered, for a few minutes. YUMMY! I wrote a song once called “A Quilt and a Kettle”, telling the story of Rachel Bond’s Oregon Trail experience. She basically walked to Oregon from Indiana! As she walked, she found a kettle on the side of the trail, picked it up and kept her patchwork pieces inside. As she walked, she pieced a quilt. Here’s a picture of the actual kettle, which is still in the family. 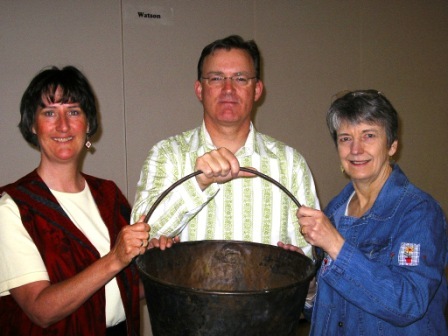 Scott, in the middle, is in the family of Alan and Rachel Bond, and Mary Bywater Cross wrote the book about Quilts of the Oregon Trail, where I found the story. I love this story, and am so happy to have met both Mary and Scott (and to have held the kettle myself). I don’t make king-sized quilts. A very dear friend asked me once to make one, and I declined. Sorry, I just can’t fit it all under my sewing machine (and I do all my own quilting). So I don’t have ANYTHING in my sewing room that’s king-sized! 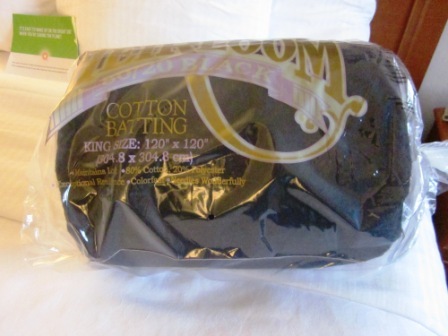 That being said, I have just purchased a king sized roll of black batting to offer my classes (it’s hard to find sometimes), so I offer this as my king-sized in my “sewing room” (the car, just now). This will cut a lot of fat quarters! That’s it for another Scatterdays challenge. I think there aren’t many more letters to go, and only about four of us are left doing the challenge. 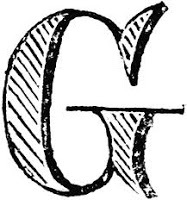 To find what they’ve written about, visit Cinzia’s blog, where there’s a list of who has posted on the right side of the page. We’re still on tour. I’m teaching a class tomorrow in Sulphur, Louisiana, then we’ll be heading north for a couple of gigs in Colorado. Back to winter, soon… BRRRRR! I’m one day late on this week’s challenge: Furniture, Books Animal, and PIGs (project in grocery sacks) in your sewing room! I’m currently on the road in Texas, and it’s a bit challenging to find the pictures I want for this week. 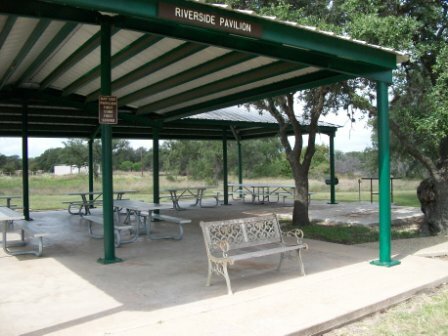 Today we stopped for lunch on our drive from Victoria TX to Burleson TX, at the Pedernales Park (very aPProPriate for a P week!). I thought of PATIO or PARK furniture! 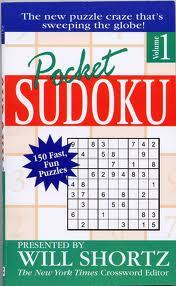 My favourite PUZZLE books are by Will Shortz – I’m here to confess I’m a Sudoku-aholic. Here’s an image from the ether (that’s Google images) of the Proper size of book – a POCKET PUZZLE book! Birds are animals, right? Especially when I visit Australia (but now most of the time we travel), I turn into a Birder! I’m delighted whenever I can spot one of my favourite birds: PELICANS!!! This picture is from a 2006 tour in Austrlia, but we just saw lots of brown pelicans in Galveston too. 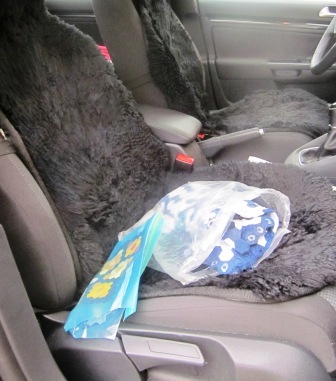 I’m nowhere near my sewing room right now, but I reckon I can come up with a PIG (project in grocery sack) in my current sewing room – the car! Hexagons in my “sewing room”! I’m hoping to get some great pictures from my upcoming visit to the Houston quilt festival next week. If you’re coming to Houston, come and visit us at Booth 1314! See the other Scatterdayers’ posts via Cinzia’s blog. 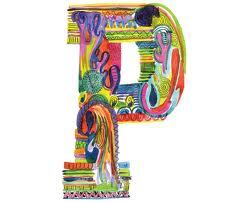 There aren’t many letters left to do in this interesting process. I think this month’s letter and categories are easy! Those pesky little Fast Fliers show up occasionally – I think they come in on the bananas. I read recently a tip on how to get rid of them, and it works!!! 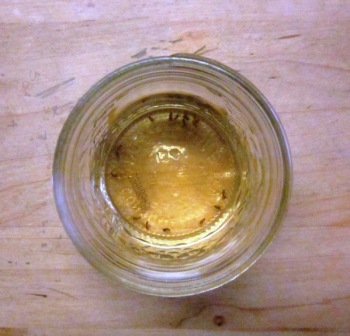 Pour a little cider vinegar In a small bowl or jar. Add a drop or two of dish detergent. Keep it on your counter or bench and count the Fallen Fruitflies! 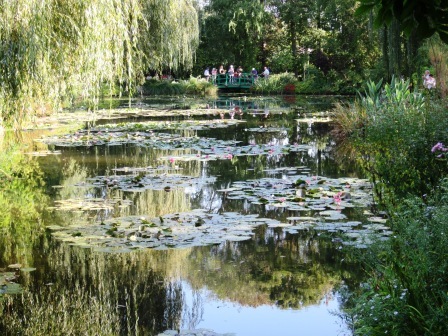 I loved being in France – it’s a place you really can live on the wine, cheese and baguettes. I have lots of lovely pictures from our time there. Before we left, we visited lots of WWI and WWII Canadian iconic war sites, and finished on an up note – at Monet’s Garden in Giverney! I do love quite a few fabric shops – I get to travel to them, and I have my favourites. Usually, though, I don’t take pictures of them (too busy shopping!!!). Some notables are: Fabric Depot in Portland Oregon, Mary Jo’s in Gastonia NC, Rosie’s Calico Cupboard in San Diego CA, any Marden’s in Maine, G Street Fabrics in Virginia, My Sewing Room in Calgary Alberta, Grandmother’s Garden in Hamilton New Zealand, Dragonfly Fabrics in Darwin Australia, oh, I could go on and on and on. And sometimes we get to sing IN the shops. I must tell you: it’s very difficult for me to concentrate on what I’m doing when I’m surrounded by fabric! 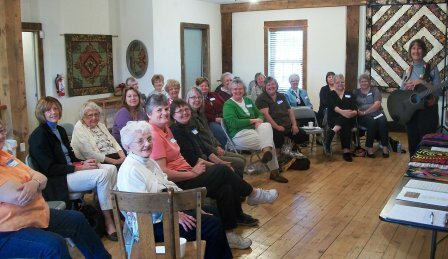 In 2012 we were on tour in Wisconsin and I was invited to sing at Mill House Quilts. It’s a lovely shop and we took pictures of our audience. ‘Twas a fun afternoon! I have been given a piece of Fabric by a Friend in Australia to make into a wall hanging. 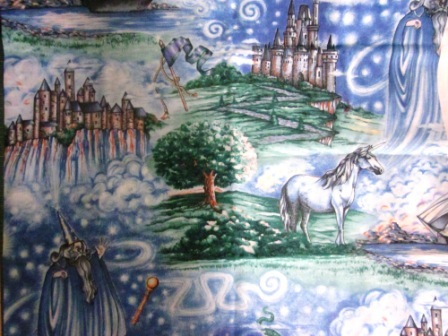 She’s very much into unicorns, and Found this fabric somewhere. She’s not so much interested in the castles and wizards, so I’ll be doing some Fussy cutting to highlight the Four unicorns. I’ll take advice on how to make this into a wall hanging for her. That’s it for me this time. To see what the other Scatterdayers have done with this letter, check out the links on the right hand side of Cinzia’s blog. Yeah, yeah – most of you will think OFFICE for a workplace, and I have done my time in offices over the years (when I couldn’t keep bread on the table as a musician). 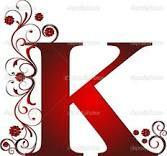 But these days I have a MUCH more interesting life!!! Right now, I’m aboard the ms Eurodam (a Holland America ship). We are sailing from Quebec City to New York City with a bunch of quilters. Today we’re in Bar Harbor Maine, and are going to be meeting local quilts at Fabricate quilt shop and then going to a lobster lunch. I am actually teaching quilting and singing a couple of concerts while we’re aboard. That means my WORKPLACE these days is on the OCEAN!! Life is tough. And the timing for this Scatterdays letter couldn’t be better! When I first moved to Calgary in 1990 I was amazed at how much art was OUTSIDE on the streets. It was a result of lots of money from the oil and gas sector, and they decided (after they built all their tall buildings) to make the downtown more beautiful with public art. There was always a surprise around every corner. Since then, I’ve kept my eyes open for art in the outdoors. I have taken to photographing all those huge (sometimes beautiful) outdoor icons – you know the ones, the giant koala, huge Pysanka (Easter egg), or moose that identify where you are, and what the community would like to be known for. We were in Miami Florida in 2007, singing for the guild there. After our show, we visited the Fairchild Tropical Botanic Garden. 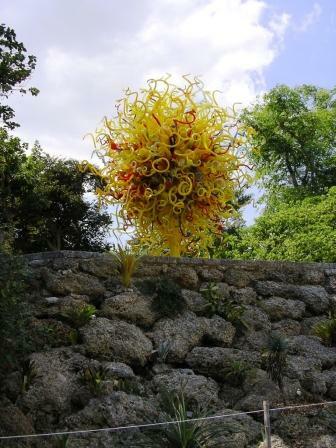 There was an installation of Dale Chihuly glass in the gardens that was highly recommended to us. 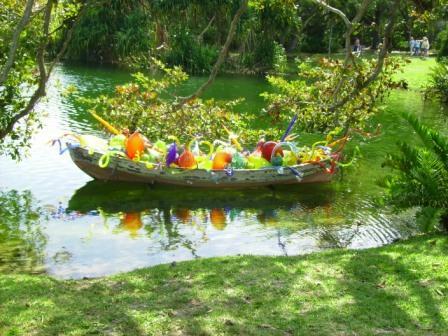 It was the first time I’d ever seen Chihuly glass – and what an amazing way to show it, amid all the plants and even floating on the pond! We went through the entire gardens playing “spot the Chihuly”. A few years later we found a similar exhibit at Kew Gardens in London. I LOVE it when art moves OUTDOORS! OLD: Oh Oh – I didn’t do this one! I’m in a very Old part of the world just now. 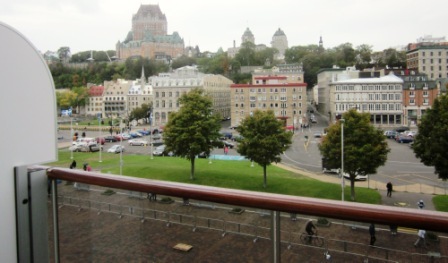 How about this picture of Old Quebec City, which I saw from my stateroom window the first day of the cruise? This is the view today from our stateroom. Whew! Did it! Even though I’m on a ship. Next time, I’ll be back on dry land. To see what the other Scatterdayers are doing, check out Cinzia’s blog. There is a family story about my cousin’s first baby. She was heavily pregnant, and her husband convinced her to go out dancing with him. 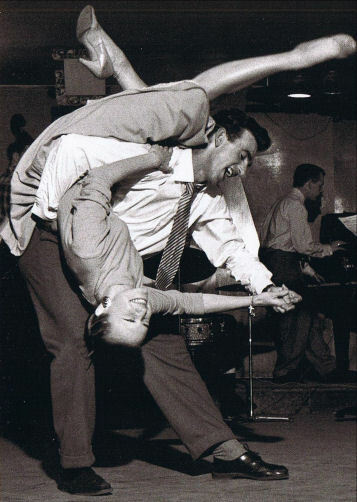 At the time, the JIVE and JITTERBUG were all the rage. A particularly athletic dance style, the JITTERBUG involved the woman’s feet leaving the floor as her partner threw her about. I have no idea how Jim was able to do this, and it attests to his athletic prowess himself. Well, that’s the story anyway, however true it is. I believe she went into hospital the next day and delivered a happy (dare I say bouncy) baby boy! In the days before computer games, iPads, and even Atari, there were games of skill like marbles, pick-up-sticks and, yes, JACKS. 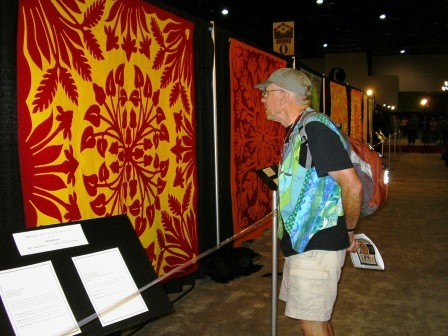 In 2009 we attended the Houston Quilt Festival (we’ll be there again this year). It’s been very interesting to see the changes over the years we’ve gone, and one of the most notable is the increase in quilts from Japan. Their work is extraordinary, and it seems that each person there specializes in one sort of quilting, then takes the technique to the Nth degree. Notable one year was an exhibit of about 15 king-sized hexagon quilts, made of 1/4″ hexies in kimono silks that I saw there – made by two women over the course of their lives. Phenomenal! 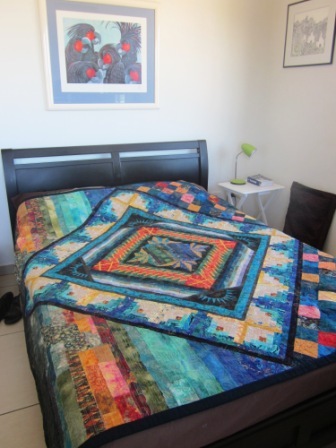 But in 2009 what was most notable to me was the large quilts in the hand made category. Usually there are differences between the quilts in this category, and include many different techniques: whole cloth, traditional, etc. I was surprised to see the entire category (all but one) comprised of large Hawaiian quilts, and ALL of them from Japan! JOHN looking at JAPANESE quilts at the International JURIED show. In two weeks, I’ll be aboard the ms Eurodam in Bar Harbor Maine, our Fall Colours Quilting Cruise. I hope I’ll have internet access so I can do the next challenge: O – Discarded, Workplace, Arts and Old. 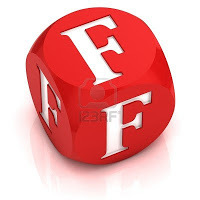 First of all – sorry everyone for missing the last one – I had it almost ready to go, but ran out of time to find the pictures. I’ve been writing lots and lots of patterns prior to heading out on tour, so I’m ahead of the Block of the Month until next July. I finished the last pattern today (HURRAY! 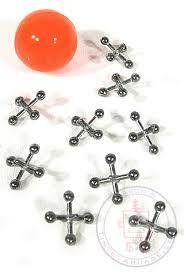 ), so I can get back to normal life…. So, here we go this time. PANTRY: What’s in my pantry? I was hoping for some EAGLE brand anything. Nope. Last year my friend Susan Purney-Mark went to volunteer in Haiti. To help raise funds for the orphanage, she brought back a lot of coffee and vanilla from there to sell. 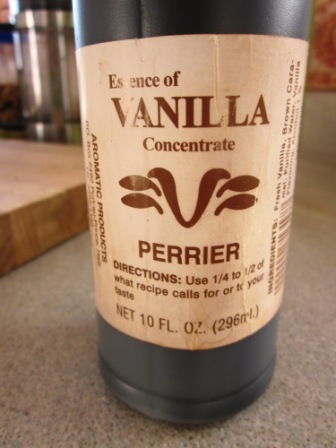 I love the ESSENCE of Vanilla! I have been working for the last year on a series of quilts that are all destined to be a part of my very first Gallery show. I have challenged two friends – one a painter, one a potter – to join me. 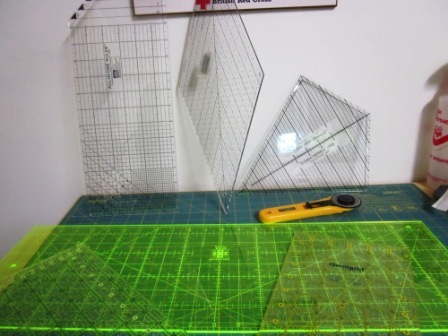 We are all planning to create 10 pieces on the theme of Refractions. Recently we’ve confirmed the gallery for the last couple of weeks of February here in Victoria. It will be at Cedar Hill Arts Centre. And all of a sudden, it’s REAL, and it’s Frightening. I don’t have a lot of flowers (except for struggling roses – we didn’t get much rain this year) at home. Several years ago we redid the front and back yards so that they would a) have no grass and b) take care of themselves. Well, it worked for the front yard anyway….. Every year, I’m happy when the deer don’t munch the first shoots of this flower, so I get to see it now. 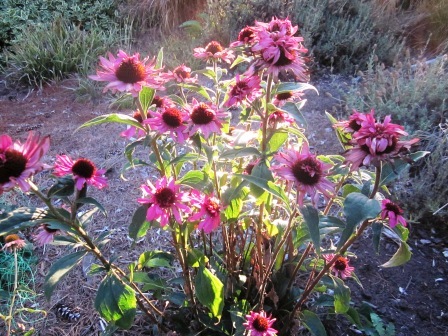 Here it is: my ECHINACEA PURPURA! Okay, this is the “quilty” one. Exciting? Well, Essential, anyway. Quilters live for their rulers. I present: EDGES!